Luke Pasqualino, one of the stars of the U.K. version of Skins, will play a young William Adama in Blood & Chrome. In October of 2010, SyFy announced production of a new series in the Battlestar Galactica series. Blood & Chrome will focus on the rookie days of William Adama on the brand-new Galactica. Edward James Olmos played the role in the 2004 Battlestar Galactica series, and SyFy has just announced Luke Pasqualino will step into the commander's shoes in the prequel. 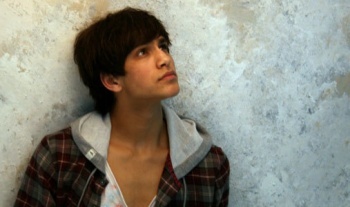 Pasqualino is best known for his role as Freddie Mclair on the original British version of Skins. Blood & Chrome is set in the tenth year of the first Cylon war, and will focus on the intensity of the battle between humans and Cylons. Starring alongside Pasqualino is Ben Cotton (Stargate Atlantis, Hellcats) as Adama's commanding officer, Coker. SyFy will kick off the new show with a two-hour pilot, but have not yet specified an airdate. To placate BSG fans in the meantime, SyFy has released concept art, which can be seen here.